All branches of the SA National Defence Force (SANDF) will undertake a joint simulation exercise with the US armed forces. South Africa’s Army, Air Force, Navy, and Health Service will take part in the exercise in South Africa’s Eastern Cape. 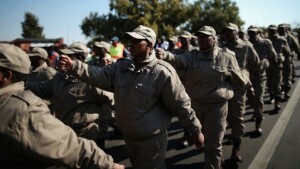 A SANDF announcement on Thursday said the drill would aim to raise preparedness for intervention in an unstable country. “What we simulate is what is currently happening in a lot of countries in the world, especially in the African continent,” said South African Navy Captain Jaco Theunissen. The joint peacekeeping and humanitarian exercise has been codenamed Shared Accord 13. Officials said it is part of the efforts by the US Army Africa (USARAF) to ‘incorporate a partner nation in an drill prior to going to Africa’. Five-thousand South African soldiers will participate in the joint exercise, according to the captain. However, independent defence and strategic analysts are questioning the wisdom of the decision. Professor Anthoni van Nieuwkerk at the Centre for Defence & Security Management at The University of Witwatersrand says this could seriously undermine South Africa’s foreign policy. “Effective and efficient management of complex humanitarian emergencies is key to the stabilisation of Africa’s trouble spots, and joint military exercises assist in preparing personnel for this task. However these activities do not take place in an apolitical context. Given the strategic global South orientation of South Africa’s foreign and defence policies, the choice of military partner is critical. It is difficult to calculate how this exercise with the US military will advance the country’s, and Africa’s strategic interests,” Nieuwkerk told The BRICS Post. “If anything it has the potential to undermine South Africa’s strategic foreign policy direction and will complicate Africans’ quest for continental stability, development and democratic governance. A public Roundtable is necessary to engage policymakers on both South African and the US sides on these questions and choices,” he added.